The public got a first look at the plans to improve safety along US 26, more commonly known as S.E. Powell Boulevard, from Oregon Department of Transportation (ODOT) officials in the Cleveland High School Library, on Friday evening, November 10. 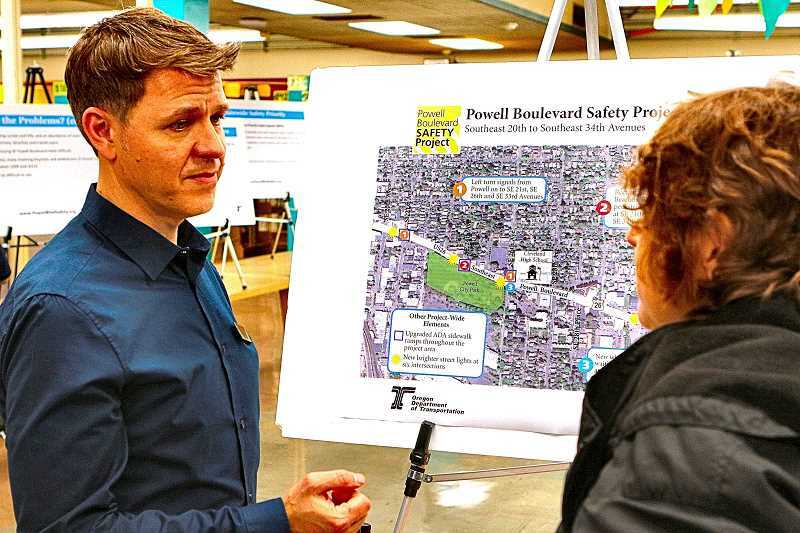 "It's called the 'Inner Powell Safety Improvement Project'; providing $3.25 million worth of safety improvements on Powell between S.E. 20th and 34th avenues," remarked ODOT Region 1 Public Policy & Communications Manager, Shelli Romero. "Tonight, we're letting people know a little about the construction schedule and the construction impacts, what they should expect when the project begins in February." The aim of the project is to increase safety not only for motorists, but also for pedestrians, bicyclists, and transit users, Romero explained. "This busy stretch of U.S. 26 has a history of safety problems, and has become a high priority for improvements." "For Cleveland High School, at the southeast corner of 26th Avenue, we will expand the area where a lot of students congregate on the corner to cross the street and go to school, so we will be constructing a Pedestrian Waiting Area right there," Romero told those present. "This larger area for them to assemble will hopefully keep them from standing in the roadway on 26th Avenue!" Given the high volume of traffic on this boulevard, there will be a lot of nighttime work, and motorists will encounter lane restrictions during the project, Romero said. And, neighbors living along 14-block stretch of the thoroughfare will experience some construction noise as contractors demolish and reconstruct ADA ramps, and relocate utility signal poles. "It's a year-long project," Romero said, starting this February, and continuing through January of 2019. "We're really excited to implement the safety projects in this corridor, because we recognize the crash history here is less than ideal, and we are happy to bring this important safety project to Southeast." Of the many people at the CHS open house, resident Peter Clough said he is "a little disturbed that there seem to be so many unavoidable jurisdictional issues between the City of Portland and ODOT. For example, it's difficult to get answers to questions about visibility issues -- especially about removal of trees along the road. It seems that vertical advertising banners are blocking visibility more than trees do!" Whether you call it "US 26" or "Powell Boulevard", be ready for construction coming to this very busy highway starting this winter and lasting all year long.